A distinctive two toned, rigid leather bag. 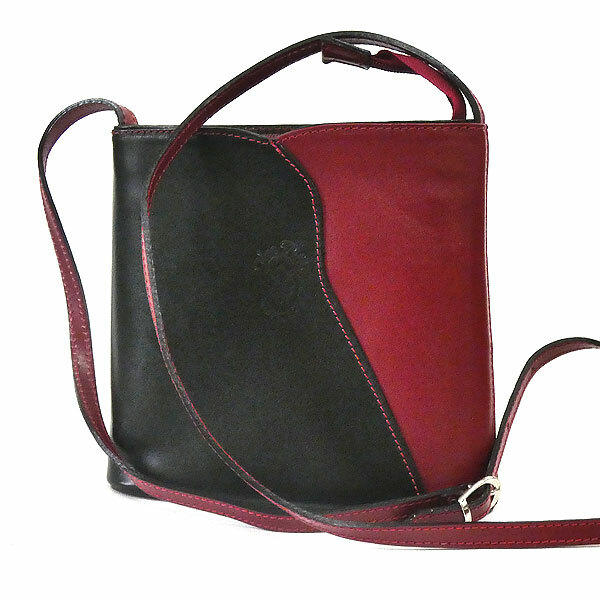 On the front of this Italian made shoulder / cross body bag is a curved diagonal panel of black leather with red stitching, overlaying an attractive burgundy red panel which extends to the side. The back of the bag is in black leather with a red zip. The bag has a black lining with a zipped pocket and is closed by a red zip. The long handle to the bag, which is adjustable, is in red leather. The bag is approximately 20cms in depth x 20cms at its widest at the bottom, which is a little over 7cms.